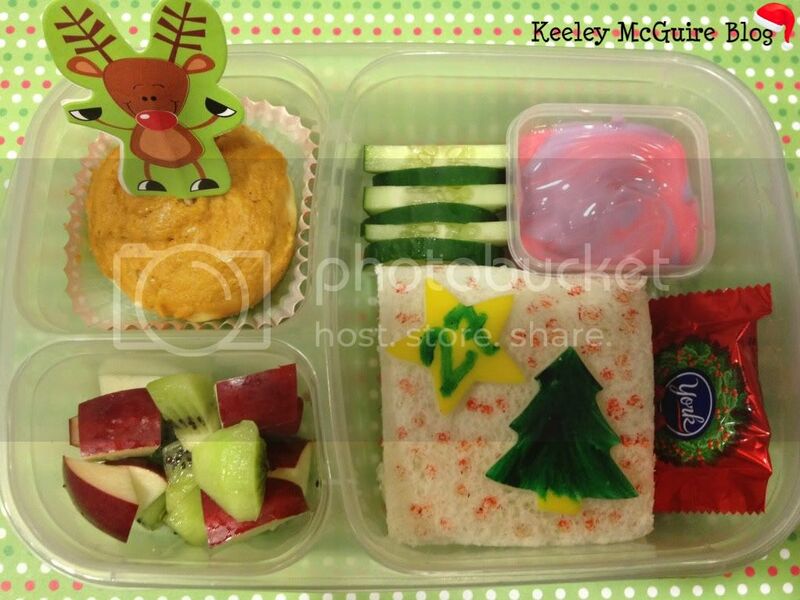 Gluten Free & Allergy Friendly: Lunch Made Easy: It's beginning to look a lot like Christmas! Lunch Made Easy: It's beginning to look a lot like Christmas! I had the idea to make Little Miss's lunches an advent, of sorts. :) Every day I intend to somewhere include a number somehwere in her lunch with how many days are left until Christmas. As of Monday, there will be 27 days left. She was VERY excited when I told her I'd be doing this! Lunch is a ham & cheese sandwich with a provalone star & tree cutout ontop, decorated with my Betty Crocker Food Writer pens. Above the sandwich are some cucumbers slices, a cup of yogurt, and a york peppermint patty. Top left is a cream cheese & pumpkin cupcake in a holiday liner with a reindeer pick. Bottom left are apple & kiwi dices. Lunch is packed inside an EasyLunchBox. My daughter would probably go nutty if I did Xmas already. She's super excited because we put our tree up yesterday (no ornaments yet) and then she helped friends of ours decorate their tree. We have her birthday between now and then! So cute! I am fairly new following you, do you usually make Little Miss's lunch the night before? I have a set of EasyLunchBoxes arriving tomorrow! Very excited! I've always been worried about soggy sandwiches if they are made the night before, is that not a problem you encounter? I love your Advent tin! The homemade pick is so cute! I did an Advent tin too. @Thankful4mylife - I don't have an issue with them being soggy from being made just the night before. If it were days, then yes they probably would be or depending on what you make your sandwich with - egg salad or something like that, I could see being soggy. I try to make them the night before just to make things easier in the AM, if I can, but there are plenty of days I make them in the morning too. :) I know you'll love your ELB's!! Thanks for the reply Keeley. I sure should have made lunches last night, this morning I was slowwww getting going. My ELB's arrived today! Woo Hoo!